BaJi Quan is said to date back hundreds of years and has traditionally only been used by the Emperor's imperial guards. This powerful form of Kung Fu projects energy forward like a canon. This approach to BaJi comes directly from Li Shu Wen the most famous modern master of the style. The same man whose students served as bodyguards to Mao Tse- Tung (Li Chen-Wu), Chiang Kai-Shek (Liu Yun Chiao) and the last Emperor, Pu-Yee (Ho Tien-Kuo).Su Yu Chang is in direct lineage through another famous BaJi teacher, Liu Yun Chiao. See biographical information on the teachers. BaJi is one of our favorite styles. And no wonder. Powerful, fluid and incredibly simple while being truly beautiful at the same time, Eight Ultimates (BaJi) captures your attention from the first moment you see it . Baji is known throughout China as an extremely effective form, it is often called "The Bodyguard Style". 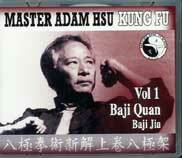 Ba Ji is based on driving force and exquisite body mechanics gleaned from the actions of the Tiger and the Bear. See more about this style. 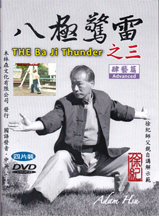 At the end of 2015, Sifu Adam Hsu came out with the first DVD collection in his Baji Thunder series, Foundations (#24896, below.) His goal was to truly teach the great style, Bajiquan, not just as he learned it from Wutan Grandmaster Liu Yun Chiao, but also by adding to the instruction from his own contribution to teaching of over 50 years. We are happy to announce the second Development (#24897) and third volume Advanced (#24898) completing the series. All in all, this amounts to 14 DVDs (over 16 hours) and, in our modest estimation, about 2-3 years of training. Hsu Sifu's method and information make this one of the most complete presentations we have ever seen on any style . Even more than that, his approach—focusing on training and usage—continues to remind us that form and routine develop from the qualities gained by understanding a style's structure, not the other way around. Timing, shape, feedback and spirit—these are just a few of the primary qualities we must practice to make the martial experience unique. In our opinion, this series demonstrates not only how Bajiquan should be taught, but how all traditional Chinese martial arts should be apprehended. We even believe that these DVDs will improve your martial arts whatever style you practice, because it reinforces the way to study, not just the study itself. For the price of about five months of lessons here is at least three years work. This is one of the few instances I can honestly say that if I were asked about studying from videos or studying with a good local practitioner/teacher, I would probably advise buying the DVDs. This first set of 7 DVDs uses Xiao Baji as its central form. However Sifu Hsu, in over 8 hours of instruction, gives much more than just form instruction. 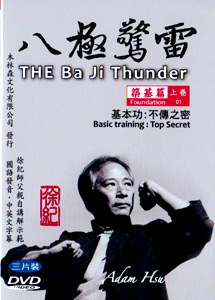 This is a thorough introduction to the entire style of Bajiquan, divided up into three main topics: Basic Training (Top Secret,) Baji Jia (Indoor Skill,) and Application (Real Usage.) Spread over these 7 disks is history, 'real' basics and their meaning, three levels of power, training methods, Baji energies, form instruction and, of course, authentic usage derived from the principles, not the form. For a comprehensive index of these contents, CLICK HERE. 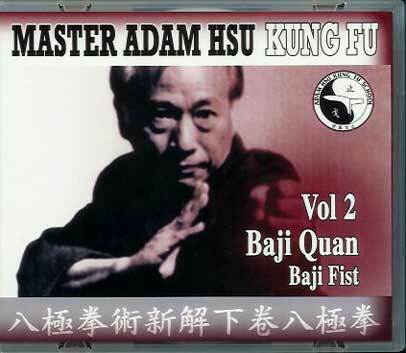 Continuing with his major presentation of Baji Quan, Sifu Adam Hsu presents a three DVD course all devoted to Baji's most popular form: Da Baji or Big Baji. The saying goes that the first form, Xiao Baji, is a "dead" or "structure" form and that Da Baji is a "live" form. Rather than emphasizing posture and structure, Da Baji introduces the fundamental fighting actions of the style, not to mention being a form beautiful for its simplicity. Not only does Adam Hsu give background, principles, goals and methods but he takes you back to traditional culture of Kung Fu by concentrating his excellent teaching method on the meaning and mastery of the movements, with the order and elaborations of the form as relatively insignificant. Not a simple empty-handed form instruction, the series is aimed at setting you not he road to high level Baji while also firming the foundation of your entire martial experience. There is a fine point to be made here:: Hsu Sifu has done something almost unprecendented in this offering: he has chosen to NOT give typical instruction for the actual Da Baji form. To emphasize: there is no step-by-step instruction—plant your foot here, punch there, etc. Instead, Hsu has used this most important form to teach how to do Baji. He teaches not only each move, but the variations, methods and rationale for each move. Stringing them together into a form, given all this information, is the easy part. Many practitioners, especially those with intermediate or advanced martial experience, will be able to use the many included form demonstrations, along with the foundational instruction, to learn the set. Or, even easier, is to pick up Hsu Sifu's earlier DVD on Da Baji (information and discount info below) where he does teach this form step by step. It is almost impossible to emphasize the importance of the lesson here: forms are important, but principles of usage are fundamental. Form derives from principle, usage is born from structure. For a comprehensive index of the contents, CLICK HERE. Liu Da Kai (Six Big Openings) and Ba Shi (Eight Shapes) are two the treasures of Baji style. This Third Series, of the comprehensive course taught by world-famous practitioner, Adam Hsu, concentrates on the core of Baji; the hands-on training. In this series pole work and partner work are brought to a new high. Two rare selections—Liu Da Kai and Ba Da Shi—are shown and explained. As though making his point about forms and training for him, both belong to “half-form and half-training” category which Sifu Hsu has talked about from the very first disk. It is here,through marching practice of some complex techniques, where you acquire Baji’s distinct flavor and power. Each powerful action explodes with a retort as loud as a cannon…or a peal of thunder. This is the heart and soul of the art and caps enough information for even an avid practitioner. This is once again a Double DVD. 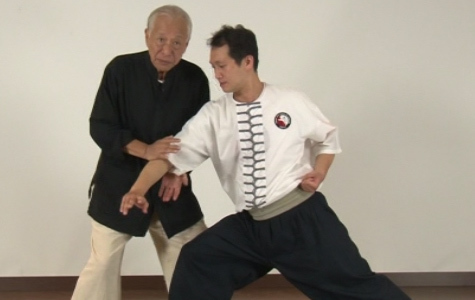 A fine presentation of Baji basics and form from the Liu Yun Chiao lineage. Tony Yang has been practicing Baji for a good part of his life. In this presentation he gives many basics, single and two person training, all aimed at creating a strong foundation in this impressive style. Nicely filmed with tasteful and clear exterior shots, this is a good addition to your Baji library. Sifu Su Yu Chang, the head of the Pa Chi Tang Lang organization, shows one of the most important forms in the Baji system: Liu Da Kai. 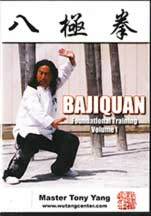 This DVD covers an introduction to the Liu Da Kai form: the True Story of the forms; developing energy of Liu Da Kai; breakdown and applications; combat techniques and a two person form with exercises. NOTE: Sifu Su is an acupuncturist and gives some very interesting information from the health standpoint which is not the standard TCM fare. 42 minutes with English subtitles for the Taiwanese narration; Hard to find!! World-renowned as an acknowledged top level teacher and also scholar of the martial arts, Adam Hsu has the distinction of also being fully dedicated to their promotion. He has unflinchingly sacrificed to engender a deeper understanding of Chinese martial arts through his numerous books, articles and seminars. The head of the TWA (Traditional Wushu Association), Hsu Shihfu has played a major part in the preservation authentic Wushu skills. See Adam Hsu's newest book. was born in Taiwan in 1940. Starting Kung Fu training at the age of 7 he studied with such legendary masters as Chang Te-Kuei, Wei Hsiang-Tang, Li Kuen-Shan and Liu Yun-Chiao. 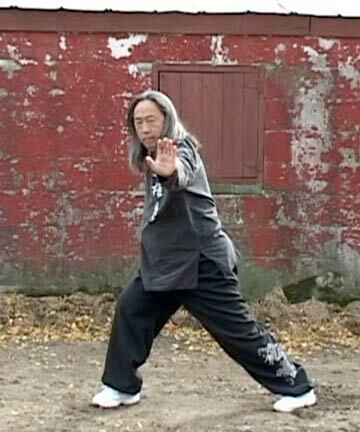 From these masters he learned Praying Mantis, BaJi, PiGua, BaGua, Tai Chi, and Xing Yi styles. So astounishing was his early career he was given the nick name "Lightening Fist" a title that, even in his 60's he still fulfils. He has students in 14 countries many of which have won Gold medals in performance and full contact. The first video is a general introduction but with a lot of information. History starts, a discussion on that rather odd name, former masters of this great art, branches and stories. Next “real basics” and what they mean. There are Baji standing exercises. Eight Word formula showing the principles and correspondences in Baji training. In the third volume Adam Hsu dedicates the entire DVD to Baji energies. He introduces and explains the famous Baji stamping, and discusses how some students stamp more for effect than function. He shows the rationale of what should really be happening in BJQ stamping with all the basic steps needed for this crucial skill. Then he outlines Baji’s rarely seen “Lean on the Metal Mountain” practice. This method expands your short-range body power. Everything is shown in a very logical and—most importantly—safe progression. Next comes post training. Where Wing Chun has one post, Baji has three. Adam Hsu shows a great method for using the posts not only as striking dummies but for angular variation, body conditioning and specific methods of entering the opponent. He gives good instructions for distancing the posts and also shows the same method you would use if working only on a single post and discusses the 8 fundamental forms of Baji striking. The method he unfolds starts with set patterns and rapidly evolves to a free-form exercise where angles, strikes, blocks and deep leg maneuvers are combined. He even shows some post training human-to-human. Baji somehow manages to perform so truthfully that it is also beautiful. This structure form is also good, in fact strenuous training. The attention to postural accuracy immediately gives you the “feel” of practicing real BaJi. Adam Hsu’s breakdowns are precise and thorough, much more so than many teaching tapes. And, believe me, Baji is one style where you want to be as accurate as possible. In his own inimical way, Adam Hsu shows the applications of the Baji Jia while simultaneously weaving everything about usage into an analysis of how to get the most out of all levels of Baji training. Very frank about this misunderstood subject, Adam Hsu shows precise and important details to each move in the form while simultaneously showing you how to look at traditional training, very different from most instructors. At the end he gives extra notes on how the forms can be expanded and explored. Flat Strike: horizontal power, no retreat, angle changes. Each move is flexible yet true to its form. Punch Downward: adapting the body and strike. Examples of distance changes and more. Side Kick Back Fist Strike: strong lateral entering, leg projection. Power issuing in sequence. Opening: Famous spread palms, management of the limbs. Rotational power at the heart of a movement. Belly Punching: Timing attack with constant pressure. Every step should "advance" your argument. Push Window Levels training, change angles, pressure to enter unchanged. Lift Window: Upward controlling of the elbows, breaking in through the enemy's defense. Spreading Palms Empty Stance: Training the spirit. Not every move needs a fight explanation. Palm Striking Forward: opening the enemy’s door to rush in, following the opponent but leading. Takedown: the power of an integrated body. Range of motion and how it helps. Rotate and Strike: Positional practice. Every form should have flexibility of angular change. Opening Intercepting and reading information. A crucial training for all Kung Fu. Arrive first. Punch Belly: Double hand control and covering the opponent. The sensing of possibilities. Rotate Palm: Directional change to strike for maximum effect. Forward Palm Strike: Advancing palms and practice tips. What we can get from a form, how ot own it. Take Down Not only the scissor mechanics but the methods of entering and capturing the opponent's balance point. Kneel Down: Demonstrating some leg Chin Na adn deep stepping. Movements: Each action is a separate practice, many layered that can be done as part of a marching practice. Usage: This series takes the same 14 actions and shows them at different levels of complexity. Training: One level of practice is with equipment and partners. Sifu Hsu gives and explains numerous strikes against poles and with partners. This practice delivers more body contact than the partner performance set.